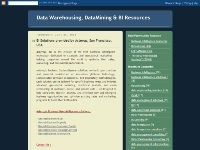 Details: The datawarehousingsites blog provides helpful information on Business Intelligence, Data Warehousing and Data Mining sites and resources. The information is very well organized and categorized and provides a complete source of information on topics related to data management and business intelligence. The website points to the BI consulting services providers around the world (especially USA, UK and Australia) which provide solutions on such technologies as Oracle, Teradata, Pentaho Open Source and OLAP.